Whatever the occasion, give them what they've always wanted, or quite possibly something they never even imagined...Give them the gift of an experience. Excitations' experiences are an engaging answer to giving - each one selected to thrill, rejuvenate, educate, or simply enjoy. Excitations is the nation's premier provider of gift experiences. Our experience partners are carefully chosen and represent the best in their fields. Try us! 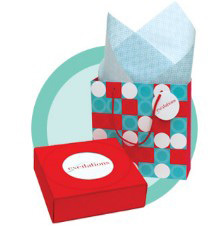 Excitations offers a simple, innovative gift solution guaranteed to leave a lasting impression. Fly fishing or feng shui? Wine tasting or whitewater rafting? For those with a mind of their own, give them the gift of choice! Our Circle Choice Packages allow the recipient to choose from a diverse mix of experiences grouped by price rather than category. There are six levels to choose from - ranging from the reasonably priced to the extravagant. Shop now.